Major depressive disorder, psychotherapy, depression rating scale MARDS. At the terms of six months supportive therapy of this investigation, the application of supportive intervention of the therapeutic team, consistent by clinical psychologist, psychiatrist, nurses, social worker and occupational therapist, was to localize through the mental structures of the depressive patient the pain and the anger that stay trapped inside him and to help him express them, emerge the mental and psychological reasons that hide behind the depressive symptoms, to mental- educate and support the depressive patients, by cognitive techniques or expressive type techniques.15,17 Moreover, localizes the anger and pain of patient and connects those feelings at conscious level, with “reference persons” or past or present situations which exist in subconscious level and were important for the birth of depressive structure of patient. Only at this time, the important steps for the removal and remission of depressive symptoms take place. Aim of the study was to explore the cumulative effect of psychotherapy over pharmaceutical therapy and the recession of symptoms of patients hospitalized with MDD. It was searched the period of recession of symptomatology and the holding time of recession up to 6 months of surveillance after introductory hospitalization. The symptoms have to stay for at least 6 months. At some patients depressive feeling was accompanied by psychotic elements, tingling, and ideas of self accusation or destruction of “Ego”. Patients’ admission requirements at the sample of this study, except those which defines the DSM-IV, was the age space from 26 to 60 years, the time that disease started >/ 4 years and the gravity of symptoms with prices at scales of depression of Montgomery Asberg MADRS>/34 and the clinical global assessment, CGI>/5. We recorded the progress of symptomatology from the first week of introduction and every 3 weeks until the 24th week of hospitalization. All the patients pharmaceutical therapy, 18 of them were subjected to combined therapy of psychodynamic detailed psychotherapy (PDP) and pharmaceutical therapy, 12 to combined therapy with cognitive behavioral psychotherapy (CBP) and pharmaceutical therapy, 16 at combined therapy of simple supportive and pharmaceutical therapy, while the other 16 were objected only to pharmaceutical therapy. Patients were in random classified in 4 groups of combined therapy (specifically 3 groups of combined psychotherapy with pharmaceutical treatment and 1 group of only-therapy with pharmaceutical therapy), after primary being equated in age and in depressive’s symptomatology gravity. The progress of their depressive symptomatology was recorded by use of the scale of depression of Montgomery and Asberg from the introduction week and every third week, until the 6th month of therapy, Patients got antidepressants (venlafaxine, fluoxetine, fluvoxamine, citaloprame, paroxetine), antipsychotic (risperidone, aripiprazole) and benzodiazepines. The study was double- blind, namely the patients were in random classified in these 4 therapy groups without knowing about the type of therapy that they got, while in the other hand therapists didn’t know about the recording of therapeutical progress and the progress of patient’s depressive symptoms, while they were evaluated from independent judge- therapist. The sessions of detailed psychodynamic therapy were hourly with frequency 3 times a week and during all the semester of patients’ surveillance. The sessions of cognitive- behavioral were hourly, they were taking place once a week and their total number was 20 sessions. The sessions of detailed psychodynamic and cognitive- behavioral were conducted by clinician psychologist and psychiatrist. The supportive was taking place 2 or 3 times a week for the semester that the investigation lasted, the intervention was of half an hour till three quarters of hour, and was conducted from nurses and psychologist. The patients were informed that they were going to participate in an research study, but their personal data wouldn’t be published but only the total data of the progress of all patients that take part to the study, by maintaining the medical and psychological confidentiality. 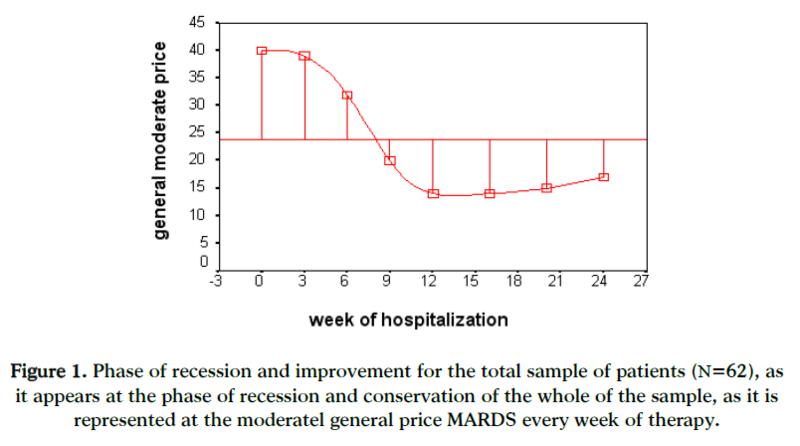 The first sign of recession is being observed to appear already from the 6th or 7th week of hospitalization, with the reduce of depressive symptomatology of patients to be recorded at the total prices of MARDS from 41 at the introduction week, to MADRS=39 the 3rd week and MARDS=32 the 6th week of hospitalization, regardless therapy, as it appears in figure 1 [F(1,30)=12.68,p<0.01]. The statistically significant improvement of depressive symptomatology of patients already from the 6th week of treatment (MARDS=32, p<0,01) is being signed as the first level of depressive symptoms’ recession, with rate of improvement 22% from the levels according to the introduction week (MARDS=41)(figures 1 and 2). The conservation level of the improvement is observed to begin about the 12th week of hospitalization (MADRS=14)(figure 1), with rate of improvement 66% form the levels according to the introduction week (p,0,01)(figure 2) and composes the conservation beginning of improvement, which maintains since the sixth month of observation (24th week). The size of effect of the improvement rate from the first level of recession of the 6th week till the conservation level of the 3rd month (12th week) was found to be 44%. The total rate of improvement at MARDS prices of depressive symptomatology, from the levels according to the introduction week since the 6th month of observation appears at figure 2 for the total sample of patients, independently of the kind of treatment. With more details, for the effect of the sorts of treatment at the reduce of depressive symptoms it was found that the sorts of treatment that affected statistically more at the conservation of recession of MDD were the following, as they resulted by the statistical analysis with multiple regression analysis (multiple regression analysis, parameter estimates) [F (3,123)=25,34, p,0.001]: the psychodynamic – pharmaceutical therapy combination with 71% of improvement from prices’ levels according to MARDS (p<0.001), the combination of cognitive- pharmaceutical therapy with 63%, while less improvement appeared either the combination of supportive- pharmaceutical therapy (41,5%) or the pharmaceutical therapy alone (39%), as well as the rate of recession started to appear from the 5th month of therapy, when the therapy included only medicines in combination of support with medicines (figure 3). It is observed that the combined therapy either psychodynamic-pharmaceutical therapy, or cognitive-pharmaceutical therapy lasted for more time, till the 6th month, the conservation period of recession of patients’ symptoms with major depression at acute phase. The combined therapy of psychodynamic-pharmaceutical therapy maintained the depressive symptomatology’s conservation improvement at 32% over the levels of pharmaceutical therapy’s effect, while the combination of cognitive-pharmaceutical therapy maintained the recession at 42% over the activity levels of pharmaceutical therapy. The cumulative rate of effect of the three types of psychotherapy (psychodynamic, cognitive, supportive) over pharmaceutical therapy, at the improvement of depression symptoms from the base’s levels of introduction week, every week of following until the 24th week, appears at figure 4. Figure 1: Phase of recession and improvement for the total sample of patients (Ν=62), as it appears at the phase of recession and conservation of the whole of the sample, as it is represented at the moderatel general price MARDS every week of therapy. 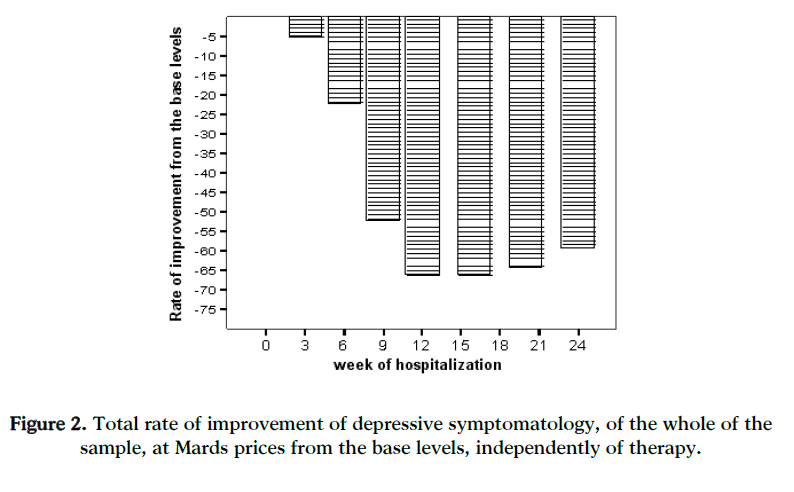 Figure 2: Total rate of improvement of depressive symptomatology, of the whole of the sample, at Mards prices from the base levels, independently of therapy. Figure 3: Effect of the kind of therapies (psychodynamic, analytic and pharmaceutical confrontation, cognitive behavioral psychotherapy and pharmaceutical confrontation, pharmaceutical therapy, supportive therapy and pharmaceutical confrontation) at the improvement effect of depressive symptomatology from the introduction week till the 24th week of hospitalization. Figure 4: Cumulative rate of effect of psychotherapy species (psychodynamic analytical psychotherapy and pharmaceutical confrontation, cognitive behavioral psychotherapy and pharmaceutical confrontation, supportive therapy and pharmaceutical confrontation) over pharmaceutical therapy. Specifically, for the PDP the recession level is installed about 6th week of therapy with percentage of cumulative effect 12,5% over pharmaceutical therapy, while for CBP the recession level is observed three weeks later, i.e. the 9th week with 16% of improvement. The conservation phase of the improvement of depressive symptoms, concerning the PDP happens at the 12th week, with 16, 7% rate of reduction of the symptoms and increases with rates 32%, 48% and 52% each at the 16th, 20th and 24th week of hospitalization and therapeutic monitoring. Regarding the CBP, the conservation of the improvement of depressive symptoms appears three weeks later of psychodynamic approach, at the 12th week of therapy, i.e. with 16% cumulative effect over pharmaceutical therapy by increasing to 32%, 39% and 40% each, at the 36th, 20th and 24th week of hospitalization (figure 4). 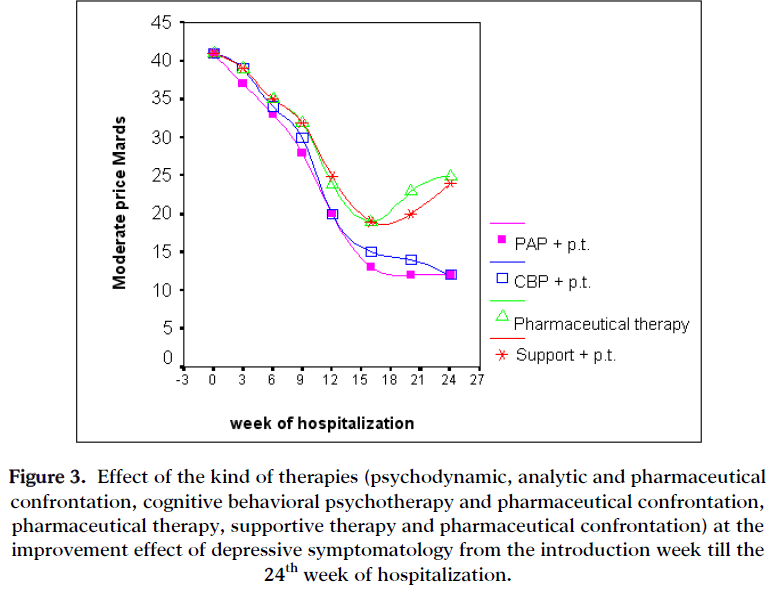 In contrast the supportive therapy shows a slightly and rather transient cumulative effect over the conservation of the improvement of depressive symptoms, since it is observed at the 16th and 20th week of hospitalization a transient change over the supportive and against the pharmaceutical therapy as monotherapy, with rates 8% and 22% each, but in 3 weeks were disappeared. Recession at depressive symptoms from the introduction week was observed at the 6th week of hospitalization of patients’ total independently of the therapeutic choice they had, by signing the first level of symptomatology’s recession of major depressive disorder (MDD), firstly due to the effect of pharmaceutical treatment, as well the 4 patient groups appeared similar decrease at MARDS prices. The beginning of the phase of conservation was observed about the 3rd month of therapy, where was found the kind of therapies to effect statistically more at the recession conservation of MDD with the greater improvement to take place at the 6th month, whether it concerned the combination of PDP-pharmaceutical therapy, or the combination of GBP-pharmaceutical therapy, while fewer effects presented the combination of supportive-pharmaceutical therapy or the pharmaceutical therapy alone. The pure clean cumulative effect of PDP, as recession phase of depressive disorders, tales place about the 6th week of therapy, while the conservation phase of recession is observed at the 9th week of therapy. For the CBP the consolidating of recession level comes three weeks later of PDP, while the conservation of recession shifts at the 12th week of therapy. At previous studies, appeared that at the phase of continuing therapy at patients who received GBP the period of recession was decreased at 12% in comparison with those who received only pharmaceuti9cal treatment or supportive therapy.10,23 Study of Maina et al., 9 showed that the recession periods of MDD symptoms were bigger than 75% when short PDP in combination with pharmaceutical therapy was applied (paretoxine or siloprame), and no when applied only pharmaceutical therapy or combination of pharmaceutical and supportive therapy. The PDP and CBP prolong the recession conservation of depressive symptoms, as they act at pro-conscious and unconscious level, touching the unsolved conflicts at the patient’s shelf psychological structures. At the therapeutic sessions the person comes to contact and faces the conflicts of pain and grieves, of anger and guilt. The therapist through the process of transition- antitransition restores corrigenda these conflicts by teach the patient to use secondary mechanisms of defense, more mature than the primary ones, that are involved in depression. The feelings of despair, pain, anger, grieve, melancholy, indisposition and un-pleasure exist on the patient’s face and his emotional non-verbal expressions of every depressive patient. The purpose of all therapists and nurses is to detect and decode at patient’s verbal and non-verbal expressions these feelings. The therapist needs to know for the “transition” of elements of anger or pain of the depressive patients to the face of nurses, psychiatrists or psychologists, and the reversal as well for the “anti-transition” of therapists’ feelings to the patients due to behaviors or patients’ verbal comments. The transition of pain or anger to the therapists or other person of the environment takes place from the depressive patient by the defense mechanism of “depressive identification of endobolis” to beloved persons from the past. It needs then in the appropriate time to be clear to the patient, that the unpleasant moments belong to the experiences, negative and positive, from the past, which in the therapeutic relationship we will try to emerge and release. The cumulative effect of psychotherapies, as the findings of this study show, lies to the decrease of depression’s relapse chance or at least to prolong for a longer period a possible disease’s relapse that would anyway take place in a period of 5 or 6 months from the prior hospitalization or depressive episode, if the patient had been subjected only in pharmaceutical therapy without any other psychotherapeutic intervention. Lepine JP, Gastpar M, Mendlewicz J, Tylee A. Depression in the community in the first pan-European study DEPRES (Depression Research in European Society). Intrern Clin Psychopharmcol, 1997; 12: 19-29. Weissman MM, Bland RC, Canino GJ, Faravelli C, Greenwald S, Hwu HG et al. Cross-national epidemiology of major depression and bipolar disorder. JAMA, 1996; 276(4): 293-9. Cuijpers P, Schoevers RA. Increased mortality in depressive disorders: a review. Curr Psychiatry Rep, 2004; 6: 430–437. Kennedy SH, Lam RW, Nutt DJ, Thase M.E. Therapy efficacy in depression. 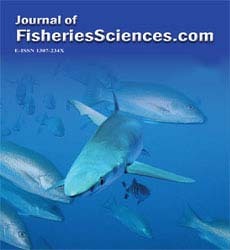 London, Taylor & Francis, 2004. Beeckman AT, Copeland JR, Prince MJ. Review of community prevalence of depression in later life. Br J Psychiatry, 1999; 174: 307–311. American Psychiatric Association. Diagnostic and Statistical Manual of Mental Disorders, 4th ed. revised. Washington APA press, 1994. Stefanis K, Soldatos K, Mayreas B. Classification ICD-10 of mental disturbances and disturbances of behavior. Publications Beta Medical Arts, Athens, 1997; 147-158. Angst J, Sellaro R, Merikangas KR, Depressive spectrum diagnoses. Compr Psychiatry, 2000; 41: 39–47. 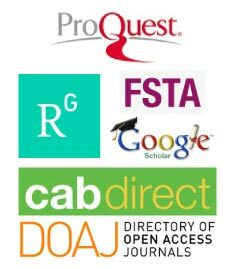 Maina G, Rosso G, Crespi C, Bogetto F. Combined brief dynamic therapy and pharmacotherapy in the treatment of major depressive disorder: a pilot study, In: S. Karger & A.G. Basel. Treatment of major depressive disorder. NY Verlag, 2007; 76(5): 298-305. Fava GA, Rafanelli C, Grandi S, Conti S, Belluardo P. Prevention of recurrent depression with cognititve behavioral therapy. Arch Gen Psychiatry, 1998; 55: 816-820. Solomon A, Haaga DA, Arnow BA. Is clinical depression distinct from subthreshold depressive symptoms? A review of the continuity issue in depression research. J Nerv Ment Dis, 2001; 189: 498–506. Cuijpers P, Smit F, Oostenbrink J, De Graaf R, Tenhave M, Beekman A. Economic costs of minor depression: a population-based study. Acta Psychiatr Scand, 2007; 115: 229–236. Beck JA. Cognitive therapy: Basics and Beyond. New York, Guilford Press, 1995. Beck AT. Cognitive therapy and the emotional disorders. New York, International University press, 1976. Georgiades M, Drakopoulou F, Oresti H, Korda E. Data on liaison psychiatry. Attachment type of inpatients and techniques of therapeutic approach. Νosileftiki, 2006; 45(1): 107-117. Beck AT, Rush JA, Shaw BF, Emery G. Cognitive therapy of depression. New York, Guilford Press, 1979. Wagner HR, Burns BJ, Broadhead WE, Yarnall KSH, Sigmon A, Gaynes BN. Minor depression in family practice: functional morbidity, co-morbidity, service utilization and outcomes. Psychol Med, 2000; 30: 1377–1390. Preisig M, Merikangas KR, Angst J. Clinical significance and comorbidity of subthreshold depression and anxiety in the community. Acta Psychiatr Scand, 2001; 104: 96–103. Vittengl JR, Clark LA, Dunn TW, Jarrett RB. Reducing relapse and recurrence in unipolar depression: a comparative meta-analysis of cognitive behavioral therapy's effects. J Consult Clin Psychol, 2007; 75(3):475-88. Casacalenda N, Perry JC, Looper K. Remission in major depressive disorder: a comparison of pharmacotherapy, psychotherapy, and control conditions. Am J Psychiatry, 2002; 159: 1354-1360. Nemeroff CB, Heim CM, Thase ME, Klein DN, Rush AJ, Schatzberg AF, et al. Differential responses to psychotherapy versus pharmacotherapy in patients with chronic forms of major depression and childhood trauma. Proc Natl Acad Sci, 2003; 100(24): 14293-6. Vythilingam M, Heim C, Newport DJ, Miller AH, Anderson E, Bronen R et al. Childhood trauma associated with smaller hippocampal volume in women with major depression. Am J Psychiatry, 2002; 159: 2072–2080. Fava GA, Rafanelli C, Grandi S, Canestari R, Morphy MA. Six-year outcome for cognitive behavioral treatment of residual symptoms in major depression. Am J Psychiatry, 1998; 155: 1443-1445. Altschul A, Simpson R. Nursing Psychiatry. Edinburgh, Bailliere Tindall 1988; 159-171. Grigoriades D, Georgiades M. Clinical experience from the psychological care of dying patients: liaison psychiatry. Exercise books of Psychiatry, 2006; 94: 133-138. Parikh SV, Lam RW. Clinical guidelines for the treatment of depressive disorders: I. Definitions prevalence and health burden. Can J Psychiatry, 2001; 46(suppl): 13-20.